Yeah, I'm still here. Been trying to get together an end-of-the-year post, and I think this is the best I can do. Ready? Looking back at my goals for this year, I think I've done OK. I've had a good, injury free year. PR'd in the 5K, not the 10K or marathon, but oh well. Did my first 50 miler, as well as a bunch of other fun, local races. In fact, I did about 25 races last year, plus a few "virtual races." That totals over 260 miles of racing. Certainly more than I've ever done. Yep, kind of been slacking off the last couple months, obviously. and some other miles at the track, or running stairs. So it was a fun year. Trying now to get myself ready and motivated for 2010. I've only registered for one race so far; the TRT 50K. Oh, and the Hood to Coast Relay at the end of August. Both of those should be fun. Awesome year, Turi! Gee, and I thought I did a lot of races last year. 25? Sweet! You had some really good races in there. You should definitely be proud. I'm stoked you'll be at TRT again. Should be fun! 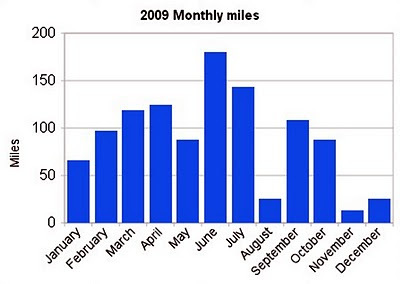 Keeping track to the 100th of a mile is just what an accountant would do.